Only a few weeks after their initial press-push the Bum Rush the Vote campaign has become impossible to ignore. With a wordpress blog, a few excited volunteers and an initial budget of less than $500 dollars Martinez canvassed for signatures and earned a place on the ballot, was able to defeat a ballot challenge in court and proceed to the CD-7 primaries. 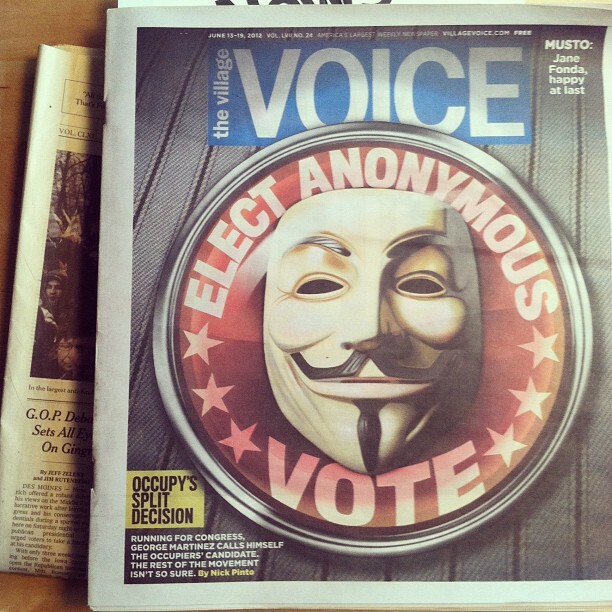 Despite eschewing any large campaign donations Martinez’s grassroots groundswell of energetic supporters lead to profiles in dozens of media outlets including New York Magazine, The Hill, Telemundo 47, and the front cover feature for the June 13th-19, 2012 issue of The Village Voice. This wildfire of press attention, coupled with the release of DFNY’s endorsement vote results forced New York City’s primary local cable news provider NY1 to reverse their initial decision to exclude Martinez from their televised broadcast of the 7th District Congressional debates. Martinez will now be joining the debates, scheduled for 4pm today at NY1’s Chelsea Market studio. To read our previous advisories related to George Martinez CLICK HERE. Tagged bum rush the vote, democracy for new york city, george martinez, nydia velazquez, occupy wall street.